Above: Legend of the Seas docked in Civitavecchia. 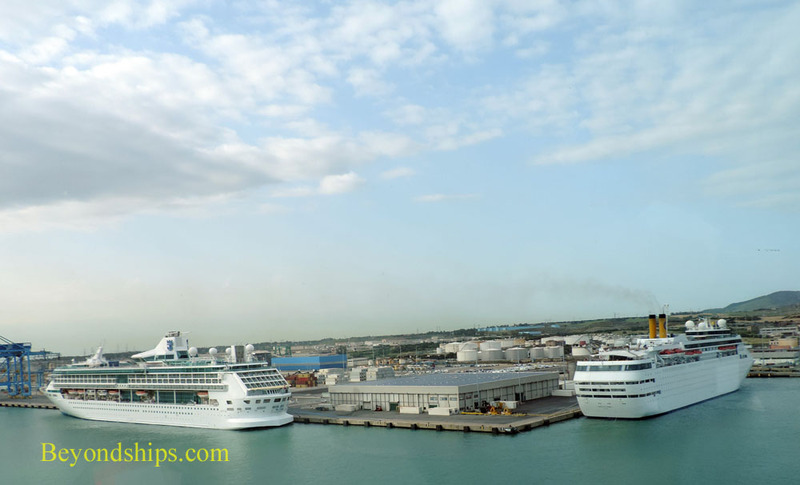 Civitavecchia is the cruise port for Rome, Italy. 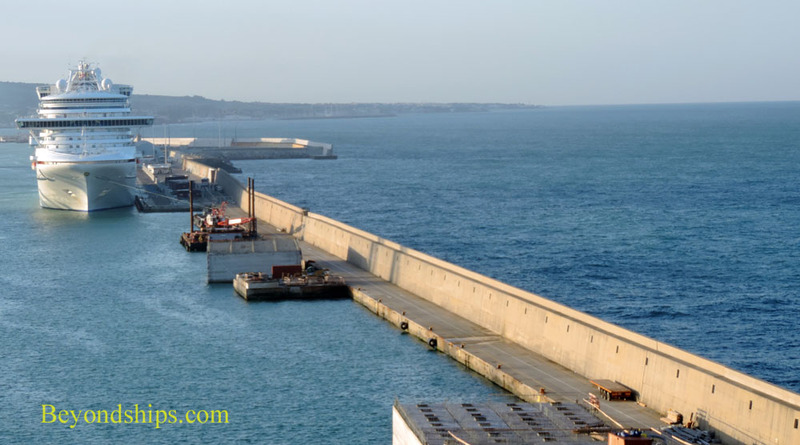 Located about 50 miles northwest of Rome on the Tyrrhenian Sea, Civitavecchia is a very busy port, handling some 2 million cruise passengers a year. In addition, the port is utilized by cargo ships and ferries. Centumcellae and it became a prosperous port. Following the fall of the Roman Empire, it was captured by the Saracens. 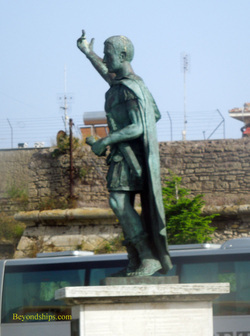 It was only after the Saracens left in 889 that the port became known as Civitavecchia, which means "Ancient Town." During the Middle Ages and the Renaissance, the port was part of the Papal States. To defend it, Pope Julius II commissioned Giulano Leno and Antonio da Sangallo the Younger to design and build a fortress. Subsequently, Pope Paul III had the great artist Michelangelo design the fortress' octagonal tower. 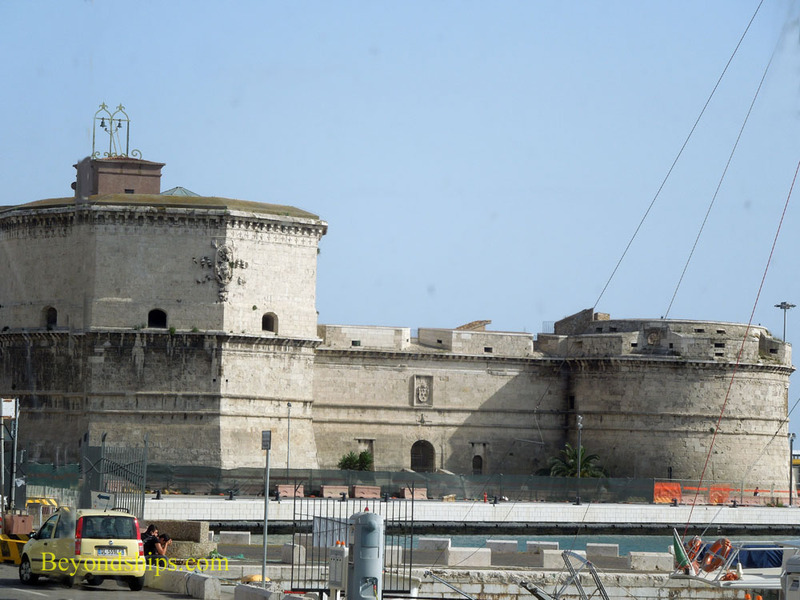 As a result, the fortress that dominates the cruise port area is known as Forte Michelangelo. 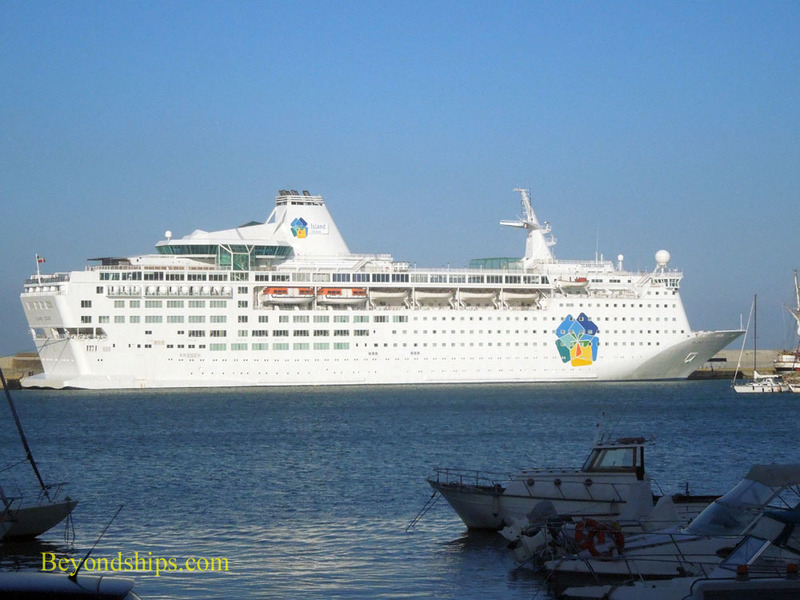 The cruise port today is a long stretch of water created by a sea wall that runs parallel to the shore. 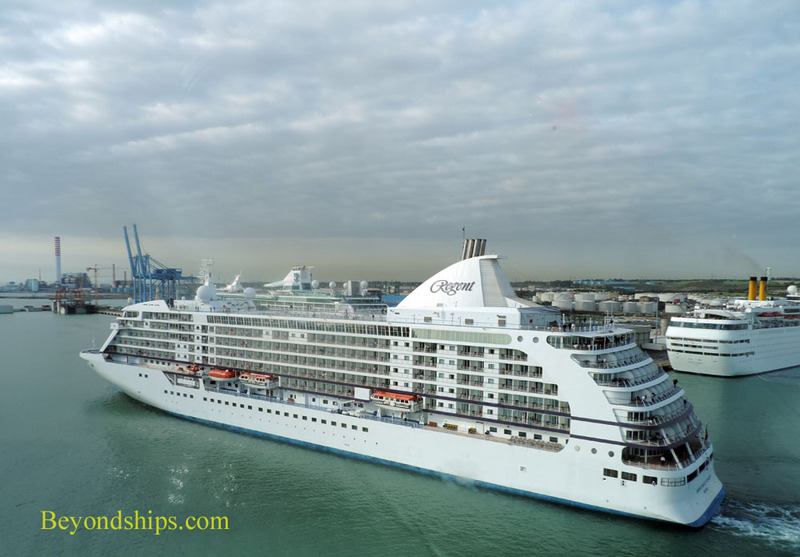 Cruise ships can dock along the sea wall or at a series of berths built into the shoreline. 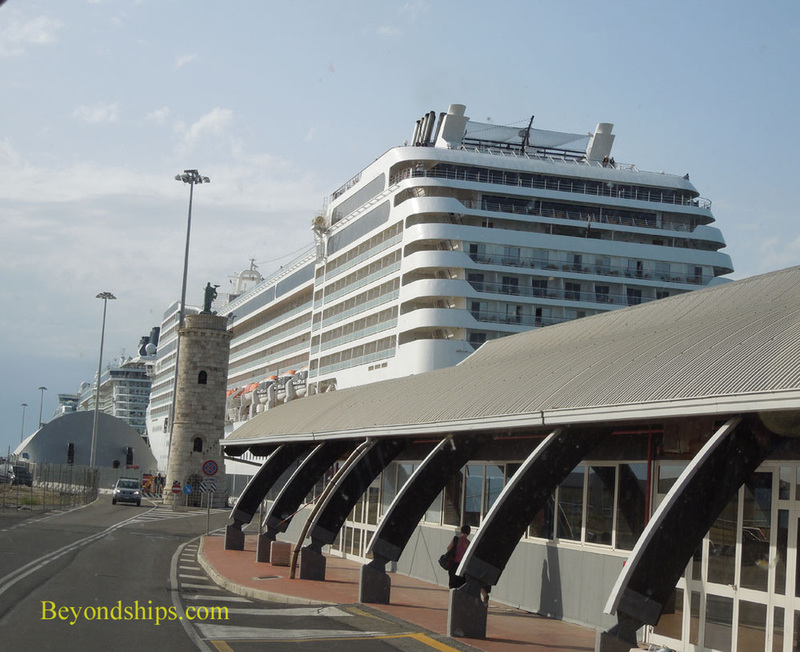 The port has three cruise terminals used primarily by ships beginning and/or ending their cruises in Civitavecchia. Rome is about an hour and a half to two hours away by car or by coach depending upon traffic. Shore excursion buses meet passengers by the ships. 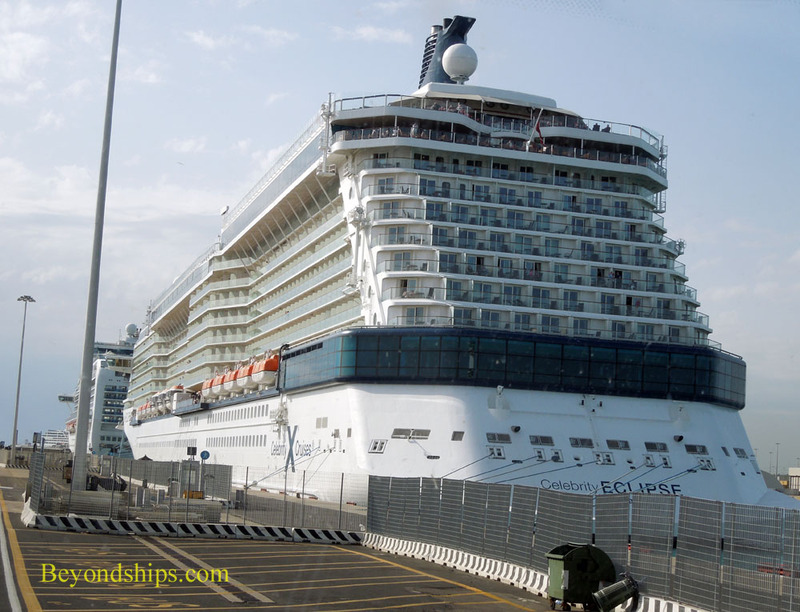 There are also private taxis that are authorized to meet passengers by the ships. These taxis only do long haul transfers and tours and usually turn down passengers seeking to go into the town of Civitavecchia. For independent travelers, the quickest way to get to Rome is by train. Express trains take about 45 minutes while regional trains can take an hour and a half or more. 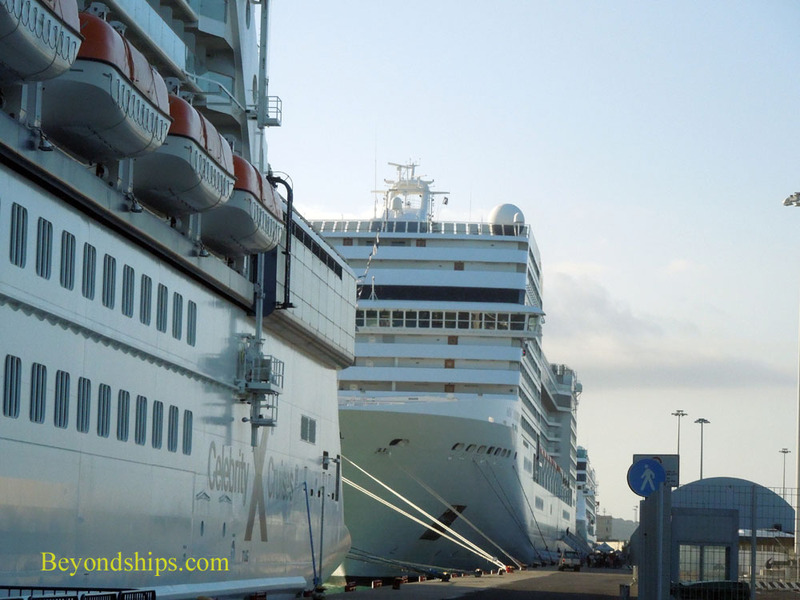 To get to the train station in Civitavecchia, take the free shuttle bus from the ship to the main gate of the port by the Forte Michelangelo. From there, it is a short walk to the station, which is on Viale della Repubblica. In Rome, passengers going to the Vatican usually leave the train at Roma San Pietro. Passengers going into the center of the city exit at Roma Termini, which is the end of the line. Cittavecchia cannot compete with its illustrious neighbor as far as things to see and do. In addition, the town was damaged by bombing during World War II and some of its ancient monuments were destroyed. Still, there are some things to see in the town including a museum of archaeology and the 18th century Cathedral of San Francesco d’Assisi. There is also a beach nearby. Further afield, at Ficoncella are the Terme Taurine baths used by the ancient Romans. Above: Forte Michelangelo is located in the cruise port area. 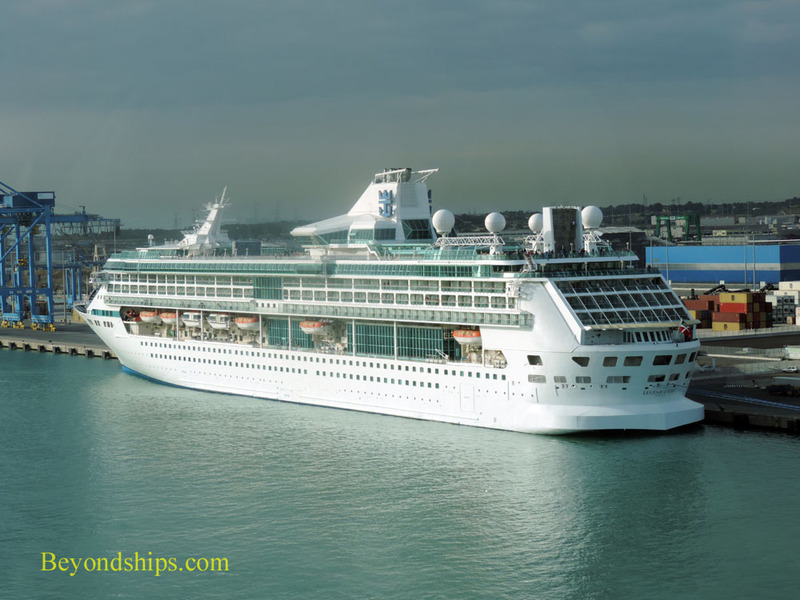 Below: Legend of the Seas and Costa Classica docked by the cruise terminal building on the inner side of the harbor. Above: Crown Princess docked along the sea wall. Below: Some of the berths along the sea wall have buildings. 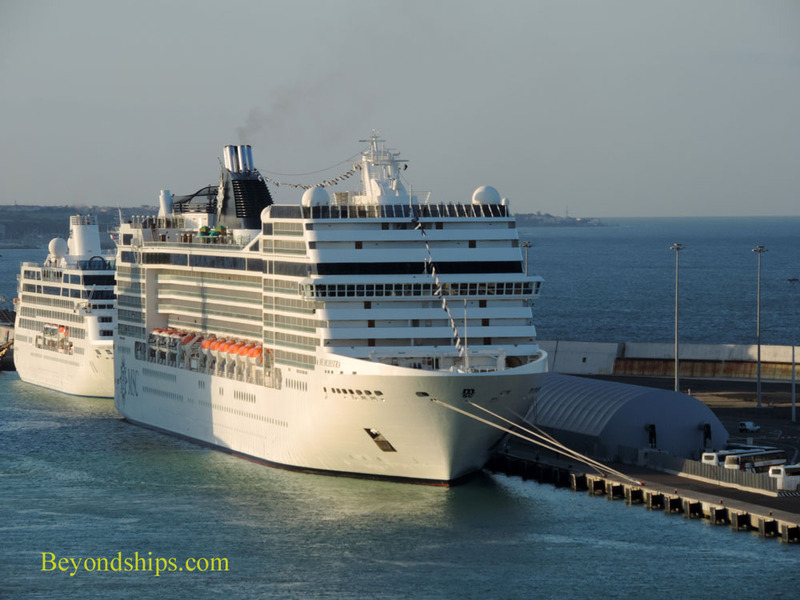 Seen in Civitavecchia: Seven Seas Voyager (above left); Island Escape (formerly Viking Serenade) (above right); MSC Orchestra and Ocean Princess (below left) and Celebrity Eclipse (below right). 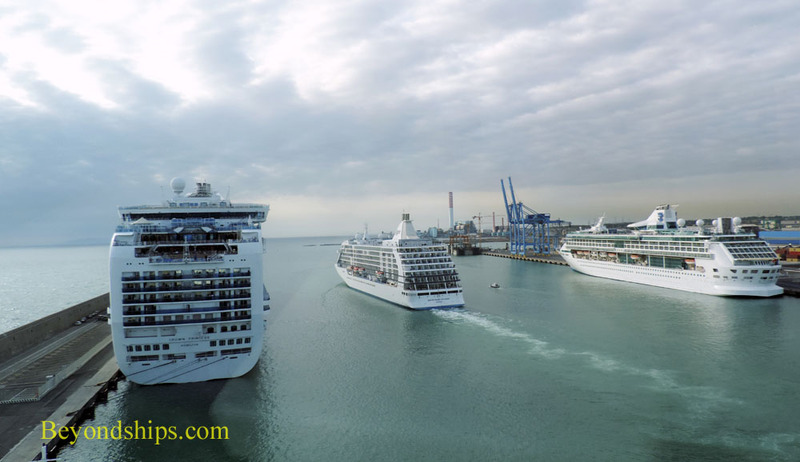 Above: Crown Princess, Seven Seas Voyage and Legend of the Seas.